I've heard a rumour that Peterson's lost their license to the old recipes. Don't know what happened to my holy grail, Irish Oak. Well, University Flake and Irish Flake are two of my favorites. I don't really care who makes them or what they call them as long as they get them right. 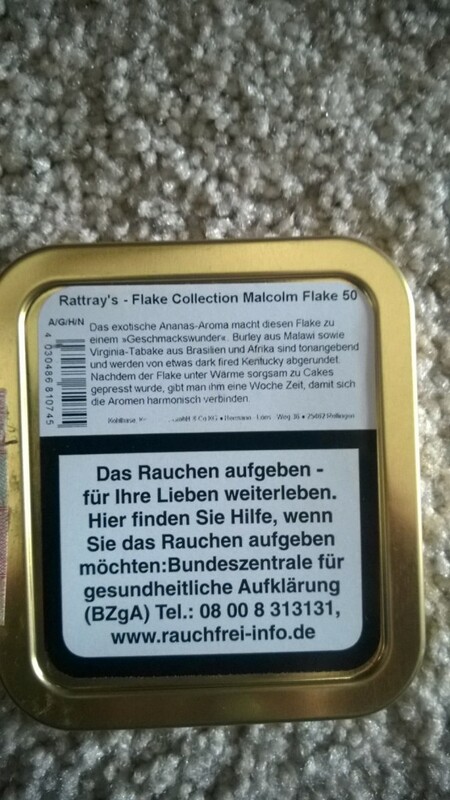 The German tobacco conglomerate manufactures all the Rattray's blends now and owns all rights to the Peterson blends but has licensed McBarens to produce them. From what I read on the Dutch Pipe Smokers Blog here's what is supposed to be the skinney : "They also manufacture Ashton, Pipe 66, Reiner, Solani, Savinelli, Sillems, Fancy and Ilsted. As for Dunhill and Samuel Gawith, I think they are only the distributors for Germany. I suspect they also manufacture the Wessex tobaccos, but have no proof other than the tobacco leaf visible on the wrapping paper of both Peterson and Wessex. BTW I read on another forum that Peterson will be manufactured by Mac Baren in the near future but K & K will still detain rights for the recipes and manufacturing; instead of calling them Peterson, they will become new varieties of the Rattray line (just like the old Ashton classics became a variety of the McConnel line, but only available in Europe). University Flake = Wallace Flake "
When the manufacturer changes, so does the tobacco. At least that's been my experience. A favorite blend is never the same. It tries, but it can't be. Every time Dunhill tobacco changed manufacturers the changes were obvious. Now that so many tobaccos have been condensed down to just a handfull of manufacturers it has become a rather silly exercise trying to find something special and keep it (unless you hoarded it when you found it, before the manufacturer changed). You can easily discern MacBaren from K&K, and from Stokkebye, and an old British blend now made by one of these is only that blend by name. Not that Peterson tobacco was ever a classic old British blend, it's always been outsourced. I was given a tin of Rattrays Brown Clunee several years ago, it had some age on it at the time too. It was glorious stuff. I recently bought a couple of tins of Brown Clunee and it bore absolutely no resemblance to the old stuff. It was pretty good, but was obviously only Brown Clunee by name. But, in this day and age, we're lucky anybody is trying to make a decent pipe tobacco at all. Depending on when you got that tin of BC it was different from the same blend done in Perth, Scotland before they were sold. I was fortunate to have smoked Red Rapparree for several years when Rattray's was still owned by the family and made in Perth. After they sold it, things did change, though it was close and still a fine tobacco, it was not, nor has been since, what the original Scottish blended RR was ! That's just the way of the beast so to speak!! Just enjoy the blend for what it is NOW as we did back then, and get on with it. Wishing it was what it was is futile !! I've hardly smoked any Peterson's tobacco, but I find these sorts of things interesting. I've never even smoked a tobacco that has changed hands before and after. I guess the conglomeration of brands into one factory probably means a lot of diminished variety. The selection of leaf has been mentioned above, and it wouldn't surprise me if the others aspects of one manufacturers process over another play a noticeable difference even if the leaf were the same. Mr. Pease has even written about the difference the micro-flora which differ from one region to another may cause a noticeable impact on the taste. The Rattrays Brown Clunee I was gifted several years back was a mix of clearly different tobaccos, brown and black, cut in long flat thin ribbons. When smoked you would get these meandering notes of solid stoved black that would weave in and out of a medium creamy base. The tin note was clean, subdued. Now it's a homogenized plain brown tobacco with a strong tangy perfumed note, a mix of clumps and extruded threads of obviously machined tobacco. The flavor is monotone. It's not at all a bad smoke, quite nice actually, but more like SG Medium Virginia in tin note (definitely not in appearance) and the flavor is like a mix of SG MVF and a semi strong topped Danish virginia. So basically they produced a pretty decent smoke, but it has nothing to do with Brown Clunee other than the label on the tin. At some point shouldn't they just declare a blend dead and not attempt these phony ressurections? I heard rumors of this some months back. University Flake and Irish Flake are favorites of mine, so I guess I'll be buying Wallace Flake and Stirling Flake in the future. It will be interesting to compare the Rattray's versions with the Mac Baren produced Peterson Peterson blends. I don't follow the Peterson brands much, but do remember smoking Irish Whisky, Old Dublin, and University Flake back around '01 or so before I took my pipe hiatus. UF was too fruity for me, but did like Irish Whisky and old Dublin. And did try some Irish Flake back when I got back into pipes around '10 but found it to be too strong nic-wise and low in the flavor dept. Guess I'm not minded to chase any of the Peterson blends these days. More for you guys. Something that's come up before in discussions of the Peterson buyout (or whatever we're calling it) is the fate of Peterson's Perfect Plug, as that's one that hasn't been included in the Rattray's line-up. I do have something to report on the matter, though I'm still not sure what, if anything, it means: last weekend at my local B&M I picked up two tins of 3P, but instead of the old rectangular tins these were in deep, circular tins. Otherwise it was the same old label, I think, with no hint as to who manufactured it, and since I haven't cracked it yet I can't contrast it to the older stuff...but hopefully this speaks to a continued future for 3P, albeit in a differently-shaped tin! Funny how these things play out. I could have sworn that some where I read that Mac Baren/Sutliff owns the Peterson label and is assuming production of the Peterson blends but K&K owns the recipes and the rights to produce the blends under the Rattray's label. Perhaps there are recipes that K&K doesn't own? This is one label that has had some crazy stuff going on with it. In the past, the round tins were produced by STG, except for Hyde Park which was a Gawith Hoggarth production, and the rectangular tins were supposedly K&K. Anyway, it's all too confusing. I am in the same boat as you with 3P's. I hope someone continues to make it, as well as Irish Flake (which I assume is now Sterling Flake). The other blends, (to channel my inner Kyle) "meh." A lot of you seem more in the know than me so a query. 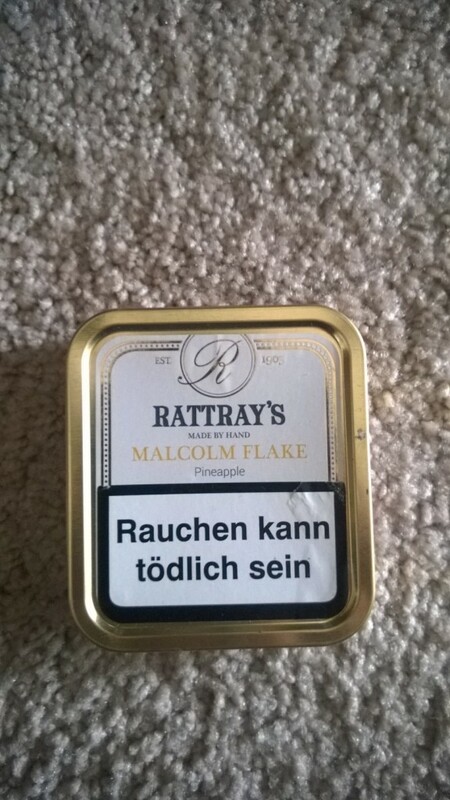 I received a tin of Rattray's Malcolm Flake. It says Pineapple on the lid. Might this be a equivalent of another famed flake? Does it say slices or pieces? You may be thinking of the pineapple that is used as part of the logo for Erinmore Flake and Mixture. These are blended by STG, not K&K and niether has any pineapple in them nor do they taste like pineaple. Different 'folks" all around. This is an original Rattray blend with pineapple flavouring. You can learn more about it over at the Tobacco Reviews. It's one of the new blends added to the Rattray's line by K&K when they took over blending. It was NOT listed in the catalog shown here in the thread from Mark nor in mine from the '60s nor did I ever see it in any of the B&Ms I used to get my Rattray's from back then. Here's a blog from a German piper who mentions that it is a bit like Erinmore Flake . If you don't read German, Google Translater works. Thanks for all the info, Brothers. Here's the tin for those interested. A euro version it seems. I read a lot on the subject. What I know is K & K "lost" the manufacturing contract to Mac Baren, but why, I have never been able to know. I don't think they voluntarily gave up the rights as Peterson is such a good seller. K & K does not have the equipment to manufacture flakes. They always have sub - contracted Orlik to produce the flakes but manufacture the rest of the line. Mac Baren, however, via one of their representatives, said they don't produce the flake tobaccos. Who does, then? It comes to mind that Orlik would as they might not have lost the rights to make them. MB produces the rest. K & K kept the recipes and launched the "new" tobaccos that are Peterson under a new name. Obviously they figured out a way to try to keep these tobaccos. It would come to reason that Orlik still makes those flakes. The question is: did K & K keep the exact same recipe and changed the names; or did they have to change slightly the recipe, not to end up accused of plagiarism? I am asking because I read on another forum that Red Lion's, supposed to be Old Dublin, is not like it at all, it's a dramatically different tobacco. As for the flakes, did Orlik kept the same recipe, or did they have to bring changes to it, for the same reasons as K & K? I read, for Sterling flake, still on another forum, that there is no difference at 99%. As for Wallace Flake, the tin description says "Pineapple" in front and is confirmed on the back of the tin ("ananas"); but the flavouring is supposed to be of plum according to TR, just like University Flake. Why say pineapple, in that case? Confused, yet? 'Cause I am slightly.